Anita Nautiyal has done B Sc in Zoolgy and Botany. She developed some teaching skills as she wanted to teach. After teaching at various schools, she became the Centre Head at Ahmedabad International School. Post that, she became Curriculum Head and Teacher Trainer in Rajkot. 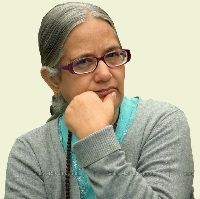 She also served as the Dean of Academics in Kashipur. She also was the Principal at Rishikesh International School. She is the Convenor of women's network of Green Party. She co-founded Ananda Vatika Green Gurukulum (AVGG) in 2016 which imparts education to school children after their school hours. An after-school activity is any organized program that youth can participate in outside of the traditional school day. After-school youth programs can occur inside a school building or elsewhere in the community, for instance at a community center, church, library, or park. After-school activities are a cornerstone of concerted cultivation, which is a style of parenting that emphasizes children gaining leadership experience and social skills through participating in organized activities. "I have done B Sc in Zoolgy and Botany and thereafter I started teaching. I have served as Centre Head at Ahmedabad International School, Curriculum Head and Teacher Trainer at Rajkot, Dean of Academics at Kashipur and Principal at Rishikesh International School. I am a Convenor of women's network of Green Party. I co-founded Ananda Vatika Green Gurukulum (AVGG) in 2016 which imparts education to school children after their school hours."